Since last October, there's been a store on Ebay that goes by the name Refurbished_Outlet, and it only sells Apple products. Although there's no contact information and little Apple corporate branding, 9to5Mac and AppleInsider think it's an official Apple outlet, because it sells official Apple refurbs. As you may know, Apple refurbs are already one of the best deals you can get, mostly because they come with the same one-year Applecare warranty that new Macs come with. 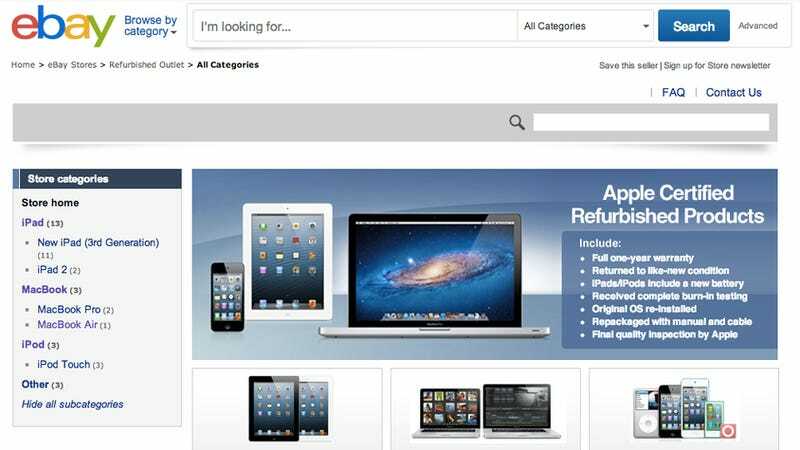 Recently, the Ebay deals have been even better than Apple's official refurbished storefront. If the Ebay store is actually Apple-affiliated, that raises questions as to why Apple is undercutting its own refurbished store. However, what it means to you is that you can score some great deals on Ebay. For instance, yesterday it was selling a 2012 Macbook Air that usually costs $1199 for $900. That's $100 less than even the official Apple refurbished store on store.apple.com.